An old adage has it that those who understand compound interest are more likely to collect it, those who don't more likely to pay it. And the children of Israel had done according to the word of Moses; and they had asked of the Egyptians vessels of silver, and vessels of gold, and garments. And the Lord had given the people favor in the eyes of the Egyptians, so that they gave to them what they required; and they emptied out Egypt. And He said to Abram, Know for sure, that your seed shall be a stranger in a land not theirs, and they will make them serve, and they will afflict them four hundred years. And also that nation whom they shall serve, will I judge; and afterward shall they go out with great possessions. So this is very surprising that according to legend (Talmud Bavel, Sanhedrin), after Alexander the Great captured Egypt and Jerusalem, a delegation of Egyptian priests approached him with the request that the Jews should be forced to return the goods they took along upon the exodus from Egypt. Moreover, they referred to Exodus XII.35 to support their request. In response, Gviha Ben-Psisa reminded the Egyptians that the Jewish people had been slaving in Egypt for 430 years without adequate compensation. In the wilderness of Sinai (Numbers I), the Jewish tribes (not counting Levites) numbered in excess of 600,000 males 20 years and up. Ben-Psisa offered to trade all the Egyptian goods in return for a fair compensation plus the interest accrued during all these years. The Egyptians chose to forfeit their claim. I am not sure about the rates at those remote times but, say, 17%-19% charged by most credit cards today may easily make a huge hole in one's budget in a much shorter time frame. The amount one borrows with a promise to return it later is called the principal. Usually, the borrower is required to return the principal with interest. In the simplest case, the whole debt is returned at the end of the specified period. Let the interest over that period be 12% or .12. Borrowing 1000 goats one will have to return 1000 + 1000·.12 = 1120 goats. With the principal of 500 bushels of wheat one will have to return additional 500·.12 = 60 bushels. P(1 + q/N) + P(1 + q/N)·q/N = P(1 + q/N)2. After the N-th evaluation, the actual debt will grow to P(1 + q/N)N.
P(1 + q)3 + p(1 + q)2 + p(1 + q) + p.
If the interest is compound several times a year, q must be replaced by the effective yearly interest. As we learn from the Passover story, it pays to know your interests. 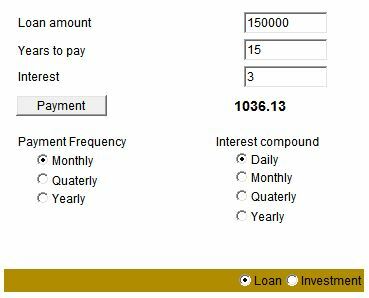 In the applet below, interest is expected as a percentage rate: insert 12 for 12%, 13.5 for 13.5%, etc. It can be used as a loan or a mortgage calculator or to verify your investment strategy.